As young boy, I was in love with X-Men and the X universe. Then,when Apocalypse showed up, I became a die–hard fan of X-Factor by Louise Simonson (writer) and Walt Simonson (artist). In 1986, they introduced Apocalypse in X-Factor #6.If you can’t tell, I am a big fan of Apocalypse. Then,at the Hasbro panel at San Diego, when I found out that Hasbro was making an Apocalypse figure I jumped for joy.Now, it is time to review this figure. Born thousands of years ago, Apocalypse is the first mutant, and there is every likelihood that he will live to be the last. His natural powers are vast, and are enhanced by the alien technology he has spent millennia bringing under his control. No other villain has so shaped the course of the X-Men, as he has tested them again and again to ensure that only the strongest survive. Apocalypse is HUGE and this figure does it justice. Hasbro did a great job on the size of this figure,which is about the same as Juggernaut, Thanos and World War Hulk. I love this new, bigger sculpt. I feel like Hasbro has really picked up their game with this figure. Everything comes together perfectly. I love his cybernetic look and the newly sculpted pieces such as his forearms,hands, knees and boots. Yet,this sculpt has some old pieces that we have seen before on another X-Men villain,Juggernaut. Hasbro reused the torso, thighs,and upper arms from the Juggernaut figure. 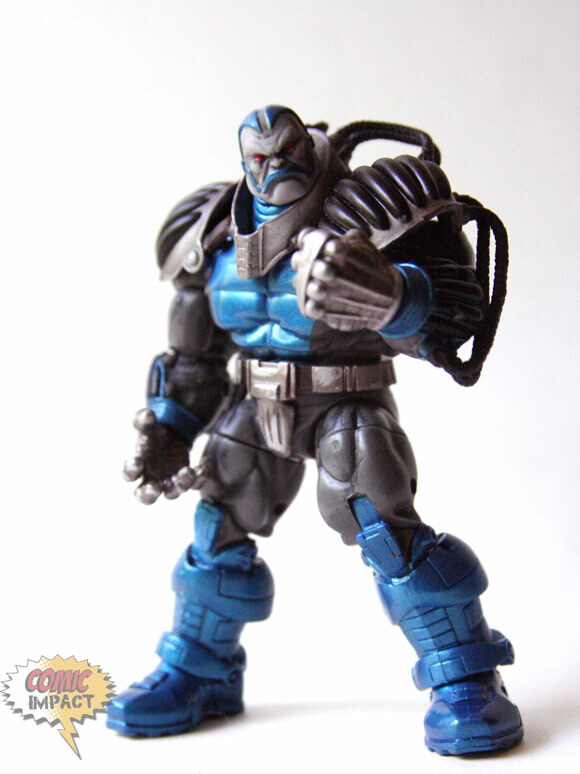 The blue and grey metal paint work amazing together to give Apocalypse that right look. I do wish that he would have an ‘A’ on his collar or belt,but what can I say? I am just that much of a fan of this character. The hardest thing about Apocalypse is making his face look right and Hasbro did it. They nailed that angry grimace just right. This big,blocky figure sculpt would work great on other Marvel characters such as The Thing or Volstagg. Ok,Apocalypse looks great. Now, let’s find out about his articulation. For a big guy,Apocalypse has some good articulation.It is not the best, yet he still has swivel-hinged joints at the shoulders,torso,ankles, thighs, wrists,hinged elbows, double-hinged knees, and ball-in-socket hips and neck. 10 out of 10, that’s right, this figure is a must have for any fans of figures.If you’re a fan of the Marvel Universe figures,take a 5 min break and go order yourself an Apocalypse, because this figure is up there as one of the best ones around.